You need healthy teeth and gums to enjoy overall health. While oral health is complex, the choices you make each day make a big difference. Take the time to carefully plan a diet that will help prevent tooth decay, gum disease, and other dental problems. A healthy diet is a proactive measure you can take to stay well. A diet that’s rich in vegetables is best for your teeth and gums as well as your overall wellness. The Academy of Nutrition and Dietetics recommends calcium-rich, leafy greens like kale, collards, and spinach. Many leafy greens also contain magnesium, which helps strengthen of your enamel. Broccoli is also great for you, offering calcium, vitamin A, vitamin K, and fiber. Vitamin A helps with your saliva production so bacteria and food particles are washed away. Other good sources of vitamin A are butternut squashes, red bell peppers, and sweet potatoes. Sweet potatoes also are rich in vitamin C, a vital nutrient to protect the health of your teeth and gums. Nuts and seeds are a great source of plant-based protein and dietary fiber. They also include a variety of nutrients that contribute to oral health. Nuts and seeds typically have iron, calcium, magnesium, phosphorous, zinc, and antioxidants. They may also have vitamin E and multiple B vitamins. Nuts can easily be added to salads, vegetable-based recipes, and rice dishes. Flaxseeds and other seeds may be ground and mixed in smoothies, muffins, or homemade crackers. You may even add seeds to fresh oatmeal. Try roasted pumpkin seeds as a snack. Or consider combining raw nuts and seeds together for your own trail mix. The longer your teeth are exposed to harmful foods, the worse it is for them. Therefore, limit how often you eat hard candy that can take several minutes to consume. Besides prolonged exposure to sugar, there’s another danger in eating hard candy. When you chomp down on hard candy, it may chip your teeth. Once a tooth is chipped, there is no getting back the original tooth. Chewy candy, like many types of taffy, will stick to your teeth and expose your teeth to the sugar for longer periods of time. That’s bad news for your enamel. Even so, you don’t have to go to extremes. Nothing has to be off-limits entirely. Simply save the worst oral health offenders for occasional treats if you want to still include them in your diet. When many people think about their diet, they consider which foods they eat, but they don’t pay a lot of attention the beverages they consume. Drinks matter, too, and they need to be included in your diet plan. Look beyond the advertisements and labels to discern when drinks are best for your teeth. Talk to your doctor and dentist for insights on the best drinks for your health needs. Choose water as your beverage of choice when possible. As reported by the Centers for Disease Control and Prevention, fluoridated water is especially good for promoting dental health. Unsweetened nut milks and artificially sweetened tea are two beverages that are better for your teeth than sugary sodas, sweet tea, lemonade, and high-sugar sports drinks. If you want to splurge on a sugary beverage as an occasional treat, try to consume it at one sitting. That’s much better for your teeth than sipping it throughout the day. When you sip on a sugary soda or other drink throughout the day, you’re consistently exposing your teeth to the sugar and decay-causing acids for several hours. That can spell disaster for your teeth. 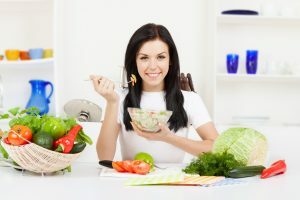 Finally, planning a well-balanced, teeth-friendly diet is one way to protect your teeth and gums. You also need to be vigilant about healthy dental care habits. Brush twice daily. Floss and swish with mouthwash at least once per day. Also, see a dentist regularly as an essential part of oral health. Contact Family First Dentistry for your next dental checkup and cleaning.